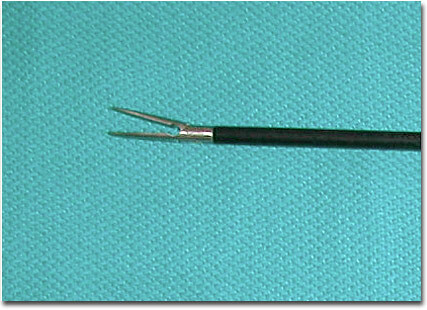 The tip of this grasping instrument (the Manhes dissecting forceps) is specially designed for grasping and liberation of hollow organs. It is very useful in infertility surgery involving the fallopian tubes since it holds small amounts of tissue securely and without trauma. The tip looks like Big Bird’s beak so it is often called the “Big Bird” grasper.